The tundra of Alaska and other Arctic regions once soaked up atmospheric carbon and locked it in the frozen ground, reducing the amount of earth-warming greenhouse gas in the air. Now, thanks to later-arriving winters, warmer summers and other effects of climate change, the treeless terrain is becoming a source of atmospheric carbon and emissions from it are accelerating, new research shows. The big change is in the late fall and early winter, according to a study sponsored by NASA and the National Oceanic and Atmospheric Administration and published Monday in the Proceedings of the National Academy of Sciences. On Alaska’s North Slope, the loads of carbon dioxide emerging from the ground in the October-to-December season have increased by about three-quarters from what they were in the mid-1970s, the scientists found. That has implications across the Arctic, they said. “We believe we’re seeing a changeover from the Arctic tundra ecosystems from being long-term carbon uptakes or sinks and switching to being carbon sources,” study co-author Charles Miller of NASA’s Jet Propulsion Laboratory at California Institute of Technology said in an interview. More carbon dioxide coming into the air from the Earth has the effect of creating more warming through the greenhouse effect, thus feeding into a warming loop, the authors said. The study was produced by the NASA program called CARVE, for Carbon in Arctic Reservoirs Vulnerability Experiment. 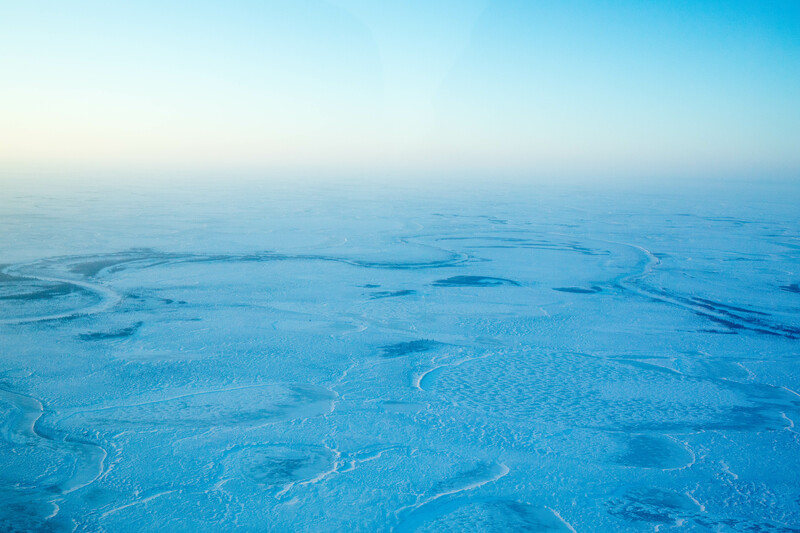 The scientists, from a variety of universities and institutions, used the CARVE research flights to measure the way carbon is absorbed and expressed above the tundra across Alaska. They were able to separate measurements of carbon streaming from the ground from that blowing in from the ocean. On the North Slope, they were able to use a long record of carbon measurements taken at NOAA’s Barrow Observatory. There they found that average October-to-December carbon-dioxide emissions in the years from 2012 to 2014 were 73 percent higher than they were in 1973. The results fit with a pattern of autumn warming associated with lower sea ice and much wider expanses of open Arctic water. In Utqiagvik, formerly known as Barrow, the month with the most dramatic warming has been October, just following the annual sea-ice minimum. It is not just the warmer autumns and later arrival of winter that is stimulating more carbon release from the tundra, Miller said. There are hotter summers and fewer “brutally cold” winter days, which also contribute to increased carbon emissions from the earth, he said. Soil temperatures at various depths are rising, keeping carbon-emitting microbes active for longer periods of the year, he said. That trend of warmer soil temperatures is well-documented on the North Slope in research led by Vladimir Romanovsky, a permafrost expert at the University of Alaska Fairbanks. The cycle of carbon into and out of the tundra is, in one sense, a race between what’s happening on top of the soil, where photosynthesizing plants are absorbing carbon dioxide, and what’s happening below the surface, where active microbes are decomposing sequestered carbon and releasing it into the air. High latitudes skew that race, making it difficult for plant growth to keep up with tundra carbon respiration, Miller said. “At some point, there’s only so much light during the day,” he said. When the Arctic night arrives and the daylight is gone, photosynthesis is impossible — but increasingly warm temperatures allow microbial activity to continue below the surface, he said. That can happen even if the tundra surface is snow-covered and the soil temperatures fall below freezing, as there can be pockets of unfrozen water, he said. “As long as there’s a little trace of liquid water available, the microbes might be able to churn out a little bit of carbon dioxide,” he said.